While store bought tortillas are fairly inexpensive, they contain preservatives and often use baking powder that has aluminum in it. A more healthful alternative is to make your own homemade corn tortillas. These are the perfect beginning to delicious enchiladas, tortilla soup, or any other Mexican recipe that calls for corn tortillas. These store well in a sealed storage bag or container in the refrigerator, but are best made up fresh. Mix the corn masa and salt in a medium sized bowl. In a separate bowl, add 1 1/4 cups of boiling water and the shortening, and stir until the shortening is melted. Pour the liquid mixture into the dry ingredients and mix with a fork. When the mixture is cool enough to touch, mix the dough with your hands. The dough is usually a little dry. Add hot water one teaspoon at a time until the dough stays together and doesn't crumble apart. Knead the dough for one or two minutes. Add more water a little at a time,if needed. The dough must be moist enough to stay together but not too sticky. Preheat a dry cast iron skillet or comal pan over medium high to high heat--you don't need shortening or Pam. Pinch off a golf ball sized ball of dough. Keep the bowl covered with damp paper towels or a damp kitchen towel to keep the dough you are not working with from drying out. Flatten the ball of dough in your hand. Place dough ball between two layers of waxed paper or plastic sheeting. Using a rolling pin or tortilla press, flatten the ball into a 1/8" thick circle. Place the tortilla in the preheated pan and cook for 45 seconds, then turn and cook another 45 seconds. If serving immediately, keep warm by placing in foil lined dish and cover. 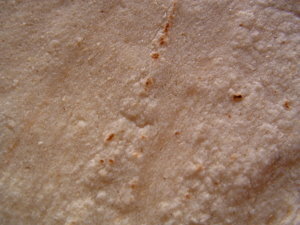 These tortillas can be stored in a food storage bag for several days in the refrigerator. I recommend the heavy-duty, hand cast iron made in Colombia. It is a great kitchen tool for tortillas, tostones, empanadas, and more. The press comes with an extra screw for the lever, and has a 4.3 out of 5 stars rating. Have you ever made homemade corn tortillas?